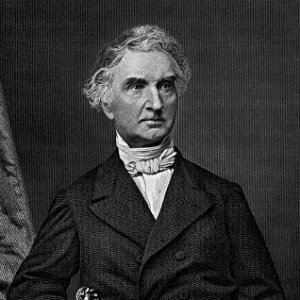 Justus von Liebig (May 12, 1803 – April 18, 1873) was a German chemist who made analytical chemistry accessible to a generation of European, British and American scientists by his innovative educational curriculum. He expanded the scientific understanding of organic compounds, and championed the use of chemical fertilizers for agriculture. He developed laboratory equipment that shortened the time required to perform a chemical analysis. Liebig was born in Darmstadt, the second son of Johann George Liebig and Maria Caroline Moeser. Liebig's father was a vendor of chemical supplies and hardware. From an early age, Liebig developed an interest in chemistry from working in his father's business. At the age of 16 he was apprenticed to the apothecary Gottfried Pirsch (1792-1870) in Heppenheim. Liebig attended the University of Bonn, studying under Karl Wilhelm Gottlob Kastner, a business associate of his father. When Kastner moved to the University of Erlangen, Liebig followed him and later took his doctorate from Erlangen. Also at Erlangen, Liebig developed a friendship with the poet August von Platen (1796-1835), who wrote several sonnets dedicated to Liebig. Liebig left Erlangen in March 1822, in part because of his involvement with the radical politics of the time but also because of his dissatisfaction with chemistry teaching there. Liebig himself noted that "the total neglect of experiment was the source of much mischief, and the persistence of the degenerate deductive method led to neglect of the careful observation of nature" (Tilden 1921, 191). In the autumn of 1822 Liebig went to study in Paris on a grant obtained for him by Kastner from the Hessian government. He worked in the private laboratory of Joseph Louis Gay-Lussac for about two years, during which time he made the acquaintance of European scientists of repute, including Alexander von Humboldt and Georges Cuvier. In 1823, Liebig published his first scientific papers in conjunction with Gay-Lussac. Much of his early research focused on the properties of mercury and silver fulminate, for which he determined empirical formulas. After leaving Paris, Liebig returned to Darmstadt and married Henriette Moldenhauer, the daughter of a state official. In 1824 at the age of 21 and with Humboldt's recommendation, Liebig became an assistant professor at the University of Giessen, soon advancing to full professor of chemistry in 1827. Liebig was enamored with Gay-Lussac's emphasis on laboratory work, and adopted this philosophy in the formation of his teaching curriculum. He established what became one of the first, and certainly the most influential, industrial-style research laboratories. Students flocked to the University of Giessen, where they could be sure to learn techniques of analytical chemistry and work in the budding field of organic chemistry. Liebig often used his influence on his students to focus research in the areas of his own interest. His teaching laboratory concentrated on the analysis of organic compounds. In the 1830s, Liebig began a research partnership with Friedrich Wöhler, who had already purified aluminum and synthesized the first organic compound, uric acid. Wöhler had prepared silver cyanate, and Liebig, Silver fulminate, each of which had the same proportion of elements in their composition while they exhibited different properties. These chemicals were among the very first recognized examples of isomers, a term coined by Swedish chemist Jöns Jakob Berzelius. Liebig and Wöhler worked together in order to unravel the complex nature of organic chemistry, which was just then becoming a major field of research. They discovered the benzoyl radical, from which many organic compounds could be derived by small alterations in its chemistry. The two scientists experimented with derivatives of uric acid that were later used in the dye industry. They also created derivatives from bitter almond oil, and established the composition of cyanic acid and numerous other organic compounds and their derivatives. They also instituted the use of laboratory animals, and performed many experiments to determine metabolic byproducts of living systems. In 1832 Liebig founded and edited the journal Annalen der Chemie, which became the leading German-language journal of Chemistry. In the 1840s, Wöhler returned to his studies in inorganic chemistry, while Liebig focused his attention on agriculture and nutrition. Liebig formulated a theory of plant nutrition in which atmospheric nitrogen played an important role as a source of sustenance for plants. This had important implications for the manufacture of fertilizer. Liebig became a baron in 1845. He He received an appointment from the King of Bavaria to the University of Munich in 1852, where he remained until his death in 1873 in Munich. The last period of his life was more devoted to conclusions based on earlier work than to original research. Working with Belgian engineer George Giebert, Liebig devised an efficient method of producing beef extract from carcasses. In 1865, they founded the Liebig Extract of Meat Company, marketing the extract as a cheap, nutritious alternative to real meat. The purpose of this extract was not to supplant meat, but rather, to utilize more fully livestock that was only used for its yields of wool and fat. In 1869, Liebig opposed Louis Pasteur's theory of the role of microorganisms in fermentation. Liebig tended to dissociate the role of yeast metabolism from the production of acetic acid, while Pasteur was assured of its necessity. Pasteur later proved experimentally that his position was the correct one. Liebig supported the atomic theory of John Dalton, about which there was much debate in the mid-nineteenth century, and which had hardly achieved universal acceptance at that time. Said Liebig, "The doctrine that matter is not infinitely divisible, but, on the contrary, consists of atoms incapable of further division, alone furnishes us with a satisfactory explanation of these phenomena (of chemical composition)" (Charles, 1854). Liebig died April 18, 1873. Liebig improved organic analysis with the Kaliapparat—a five-bulb device he introduced in 1831 that used a potassium hydroxide solution to remove the organic combustion product carbon dioxide. The device allowed scientists to do as many analyses in a day as could formerly completed in a week. The carbon content was measured by noting the change in weight of the potassium hydroxide solution which absorbs carbon dioxide. Liebig brought into common use a device that bears his name, the Liebig condenser. It consists of a jacket of cooled liquid, the liquid often being water at near freezing, that surrounds a glass pipe through which a vapor passes. The cool jacket facilitates the condensation of the vapor, which in its liquid state may be collected and analyzed. Liebig downplayed the role of humus in plant nutrition and discovered that plants feed on nitrogen compounds and carbon dioxide derived from the air, as well as on minerals in the soil. One of his most recognized and far-reaching accomplishments was the invention of nitrogen-based fertilizer. Liebig believed that nitrogen must be supplied to plant roots in the form of ammonia. He applied his theories to raising crops on a small piece of land from 1845 to 1849, but because he was using an insoluble form of nitrogen that plants could not absorb, his efforts at first appeared ineffective. When he switched to a more soluble nitrogen compound, the health of the crops improved. His invention recognized the possibility of substituting chemical fertilizers for natural (animal dung, etc.) ones. He also formulated the Law of the Minimum, stating that a plant's development is limited by the one essential mineral that is in the relatively shortest supply. This concept is a qualitative version of the principles used to determine the application of fertilizer in modern agriculture. He was also one of the first chemists to organize a laboratory as we know it today. His novel method of organic analysis made it possible for him to direct the analytical work of many graduate students. Liebig's students were from many of the German states as well as Britain and the United States, and they helped create an international reputation for Liebig. The more famous of these included August Wilhelm von Hofmann, Friedrich Kekule, Henri Victor Regnault, Alexander William Williamson and Emil Erlenmeyer. At a time when many chemists such as Jons Jacob Berzelius insisted on a hard and fast separation between the organic and inorganic, Liebig argued that "...the production of all organic substances no longer belongs just to the organism. It must be viewed as not only probable but as certain that we shall produce them in our laboratories. Sugar, salicin [aspirin], and morphine will be artificially produced." (Liebig and Wöhler, 1838). Liebig's arguments against any chemical distinction between living (physiological) and dead chemical processes proved a great inspiration to several of his students and others who were interested in materialism. In 1835 Liebig invented a process for silvering that greatly improved the utility of mirrors. He used silver nitrate, prepared in a form in which the silver can be easily precipitated upon a surface by the addition of a solution of sugar. The process was used to improve mirrors in microscopes and later, in telescopes. Liebig is also credited with the notion that "searing meat seals in the juices." This idea, still widely believed, is not true. The University of Giessen today is officially named after him, "Justus-Liebig-Universität-Giessen". Liebig's most important contribution was the training of a generation of scientists who carried on his work and who were inspired to artificially produce a myriad of synthetic compounds. The fields of organic chemistry, biochemistry and molecular biology can be traced to Liebig's researches and his ideas on the chemical basis of the life sciences. Certainly, Liebig's influence was felt, not only in his teaching, but also in his editorship of the influential journal that he published. His high-handed attitude regarding his own discoveries often put him at odds with other scientists, including his own research partner, Wohler, who expressed concern that his work was not properly credited. Liebig did not seem to be fazed by these infringements in acceptable behavior. Liebig often barked his findings, and caused much controversy in his time. His ideas were not always well-formulated, and even though far reaching, they caused a great deal of controversy that inhibited their immediate acceptance. Liebig did not always come down on the right side of a debate, as is evidenced by his opposition to Pasteur's ideas. Still, at the end of his life, he was respected as a giant in his field, both as a prodigious researcher and a pioneering educational administrator and publisher. ↑ McGee, Harold, ‘’On Food and Cooking (Revised Edition)’’ (Scribner, 2004, ISBN 0-684-80001-2), 161. Charles, William. 1854. Memoirs of the Life and Scientific Researches of John Dalton. London: Cavendish Society. 110. Tilden, William. 1921. Famous Chemists: The Men and Their Work. London: George Routledge and Sons. History of "Justus von Liebig"